C++ (pronounced "see plus plus") is a computer programming language based on C. It was created for writing programs for many different purposes. In the 1990s, C++ became one of the most used programming languages in the world. 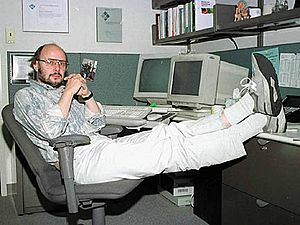 The C++ programming language was developed by Bjarne Stroustrup at Bell Labs in the 1980s, and was originally named "C with classes". The language was planned as an improvement on the C programming language, adding features based on object-oriented programming. Step by step, a lot of advanced features were added to the language, like operator overloading, exception handling and templates. The following text is C++ source code and it will write the words "Hello World!" on the screen when it has been compiled and is executed. This program is typically the first one a programmer writes while learning a programming language. // Iostream is the input and output stream; which stores functions such as print etc. This program is similar to the last, except it will add 3 + 2 and print the answer instead of "Hello World!". This program subtracts, multiplies, divides then prints the answer on the screen. // Creating and initializing 3 variables, a, b, and c, to 5, 10, and 20. C++ Facts for Kids. Kiddle Encyclopedia.